THE place to shop for all your HOME and GARDEN needs. There are actually three baby ROBINS in this nest. My recent visit to our local Home Depot, revealed more than just home and garden supplies. In the outside courtyard, there were several very large pine trees for sale. I looked at them and wondered how anyone could ever get them home. As I was walked through the area I spied a Robin tangled in a small piece of plastic wrap near the top of one of the trees. I watched as she struggled to set her self free, falling from branch to branch down the tree. After a couple of minutes, she was able to fly to the top of the building and I breathed a sigh of relief. She sat there for the longest time looking back down at the tree. Wondering what caught her attention, I looked too! 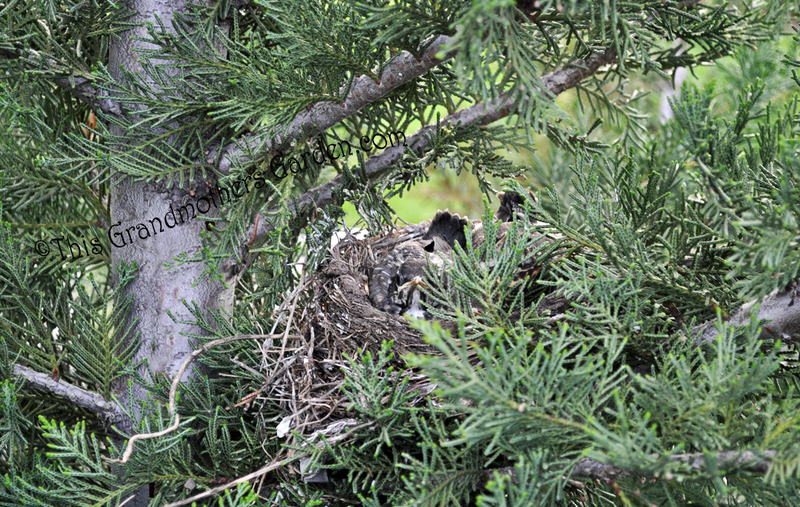 And there hidden in the branches was a nest of baby robins. 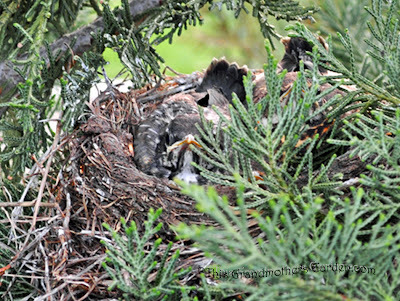 The nest was made of twigs and small branches and... pieces of plastic wrap. I stood for quite awhile as Mamma Robin made several trips to feed her growing brood. It was a slow day at the Depot and no one else was around to view the scene. I smiled at the thought of purchasing the tree and wondered if the baby birds came with it. Then I realized I don't really need another tree, and I actually have plenty of baby robins in my gardens as well. So I left the Bonus Buy for someone else to discover. I did show the sales clerk my find. I wonder if they raised the price after I left? Proof that you should always have a camera with you wherever you go. I didn't, so the pics are from my own garden. The birds look much the same... just imaging plastic wrap in the nest. I love that, perfect that you had your camera with you. When the birds would nest in the hanging baskets at our nursery, it immediately become a "sold" item. We protected those babies like they were our own. And I don't think that even their parents were as proud as we were when the babies took flight. Maybe they'll fly away before the tree sells. That reminds me that I saw a featherless baby bird dead on the ground this morning when I hadn't time to bury it. Must go back. I have seen birds flying around in these big hardware stores and Walmart but I never ran across one nesting. Poor things. How totally sweet! I hope they mark it "sold" until the fledglings take flight. Ours flew the coop.... nest.... a few days ago and they are still close by, chirping and fluttering up a storm in the trees! oh, how sweet, I hope they make it. Right now I have a robins nest on top of the arbor at my garden entry. The mom seems so perturbed when I come and go which is a gajillion times a day...Silly Robin. I hope if they sell the tree they will not take the babies away from their mother! Now you have me worried!